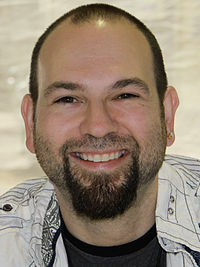 Barry Lyga (born September 11, 1971) is an American young adult novelist and short story writer. He lives in New York. Lyga majored in English at Yale receiving his BA in 1993. He then spent ten years working at Diamond Comic Distributors after having spent his teenage years immersed in comic books. During this period, Lyga had seen his short stories published. His book Archvillain was released in October 2013. and I Hunt Killers was released in March 2012. The Astonishing Adventures of Fanboy and Goth Girl is Lyga's first novel and was published in 2006. The story arose from Lyga's youthful exploration of plotting and characterization he found in comic books. Lyga acknowledges that Fanboy and Goth Girl is autobiographical in that "a lot of what Fanboy describes is [what] I went through ... the book has autobiographical elements, but it also has a lot of wish fulfillment." Lyga says that "the entire book just popped into my head all at once." Touching upon the book's violent subject matter, Lyga says,"I didn't want to shy away from the violent fantasies. We're living in the post-Columbine world." The threat of violence, though, is just a threat and "the lack of bloodshed was a pleasant surprise" as one book reviewer, Spencer Korson, said . Fanboy and Goth Girl has earned starred reviews and made the School Library Journal's 2006 Best Books list. Kirkus reviews calls it "authentic and well-written". All reviews, though, mention that the "story unfolds slowly." The story is darkly comic. It is told in the first person point of view of Fanboy, a 15-year-old boy who maintains an internal, sarcastic and funny commentary throughout the story. Reviewer Gillian Engberg described Fanboy and Goth Girl as a "realistic, contemporary story of bullying and a teen's private escape." Fanboy is obsessed with comics – graphic novels as he corrects Goth Girl – and a sub-plot trip to a "comic-book convention ... feels authentic." Publishers Weekly reported that Jeremiah S. Chechik, director of Benny and Joon, is negotiating for film rights. Boy Toy is Lyga's second young adult novel. Reviewer Kristin Kloberdanz said that it was an "astounding portrayal of what it is like to be the young male victim." The book depicts Josh, who is about to graduate high school, dealing with the news that Eve, an attractive female history teacher who manipulated him into a sexual relationship when he was twelve, is soon to be released from prison. Hero-Type is Lyga's third YA novel, also set in Brookdale. Kevin Ross (Kross to his friends) saved Leah Muldoon's life, and the town treats him as a hero. However, when patriotic Brookdale witnesses him removing "Support the Troops" magnets from his car, he's set in a compromising position. The town turns against him, and he engages in a mental and verbal fight with a classmate over the rights and wrongs and simple interpretations and beliefs of what it means to be patriotic. Goth Girl Rising is the direct sequel to The Astonishing Adventures of Fanboy and Goth Girl. Set six months after the events of the first novel Goth Girl Rising follows Kyra as she returns home from Maryland Mental Health Unit. In 2015 Lyga co-wrote the novel After the Red Rain with Peter Facinelli and Robert DeFranco. It is set on a future Earth whose population is grappling with dwindling resources. Lyga's first graphic novel Mangaman, a meta-fictional tale of East meet West, as a manga boy breaks through a hole in reality and meets a real girl, was illustrated by artist Colleen Doran. It was published in 2011, and received a starred review in Kirkus Reviews. In 2018, Lyga wrote Thanos: Titan Consumed, a novel in conjuction with the Marvel Cinematic Universe which tells the story of Marvel Comics villain Thanos. ^ Lyga, Barry; Facinelli, Peter; DeFranco, Robert (August 2015). After the Red Rain. Little, Brown and Company. ISBN 978-0-316-40603-1. Wikimedia Commons has media related to Barry Lyga. This page was last edited on 7 February 2019, at 23:42 (UTC).